Understand the Swedish culture and navigate your life in Sweden! 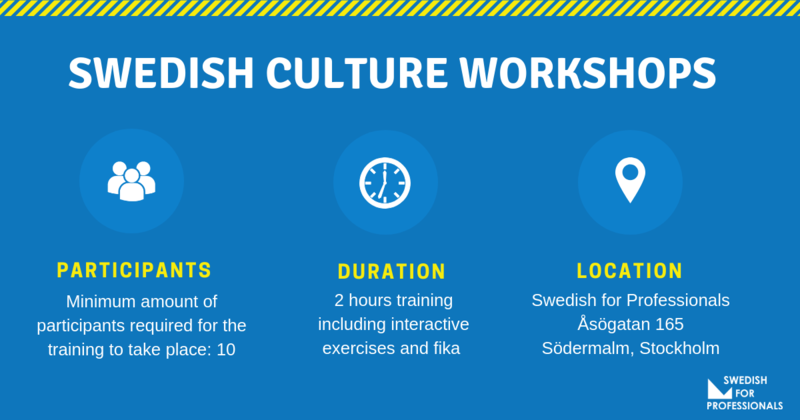 Why attend a Swedish culture workshop? Cultural understanding is important in order to navigate both professional and personal life in a new country. In the multicultural setting of an increasingly global world, intercultural communication becomes very important. An insight into another culture also challenges thought processes and can foster a better understanding of other people in general. Take the chance to get a better understanding of Swedish culture, in order to handle everyday interactions and increase your sense of belonging in society! Apart from introducing you to Swedish culture, we will use interactive exercises based on cultural theories, in order to encourage discussions about culture in general, and the role it plays in personal and professional settings. Let us guide you through the unspoken rules of Swedish society and business and we will explore together the big why behind the Swedish behavior. The workshop will be held at our office, will last 2 hours and will cost 2 250 SEK (incl. VAT). When we have enough private participants interested in this workshop, we will get back to you for your confirmation of participation as well as the coordination of the date and time of the workshop! Contact us below and we will be in touch shortly!